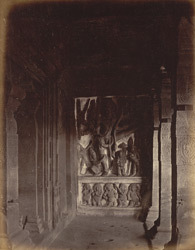 Photograph of a sculpture of Vishnu as Trivikrama in the north verandah of Cave 2 at Badami, taken by James Burgess in 1874. Badami, formerly known as Vatapi, was the capital of the early Chalukya rulers in the 6th - 8th centuries. The town is situated between two rocky hills of red sandstone that surround an artificial lake. There are two later forts that overlook the town. Around the south fort there are four rock-cut shrines while structural temples dominate the site on the opposite north fort. At the eastern end of the lake there is the Bhutanatha temple complex. Cave 2 is a Vaishnava sanctuary from the late 6th century. The sculptural panel on the right at the end of the porch represents Vishnu Trivikrama. Following a myth, Vishnu, disguised as the dwarf Vamana, transformed himself into the giant Trivikrama to fight against the demon king Bali and asked that he might have as much land as he could cover in three paces. When Bali agreed, Trivikrama with one stride covered the heavens, with a second stride covered the earth, but before he could take a third stride, Bali pleaded for him to stand on his head instead. This pushed Bali down into the underworld where he became master while Vishnu remained the master of the universe.